Hockey in Texas is growing and so is the awareness of the great things happening at Chaparral Ice. 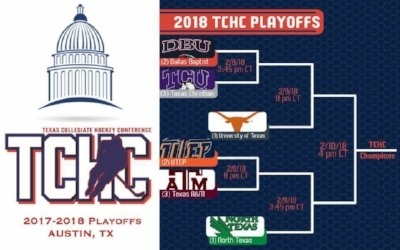 Last season the University of Texas Longhorns Men’s Hockey team won the conference title and Chaparral hosted the Texas Collegiate Hockey Association state playoffs. This year UT returns to defend title and was featured on ESPN Top 10 highlights! Congratulations to Angie Vaught on being named the Texas Amateur Hockey Association's Girls'/Women's Section Representative. Angie will organize two to three Female Development weekends in Texas as well as helping to organize the annual Texas Affiliate Camp for girls wanting to advance to the Regional and National Camps for USA Hockey. Angie is excited to share her passion for hockey with all of the young ladies in our affiliate and to help show them the pathway to play at whatever level they choose. The Gloucester, MA native played in 74 total games for the Blades over the last two seasons. He scored 2 goals and assisted on 21 others for a total of 23 points from the blue line.